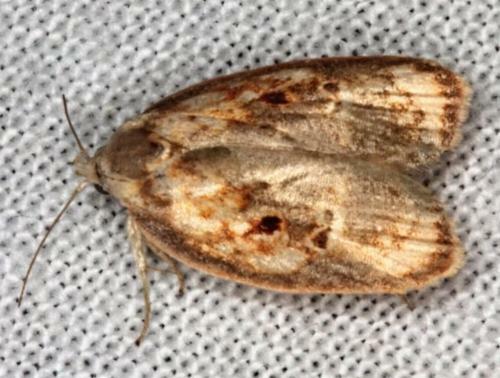 The adult moths are pale brown with brown and orange markings including dark edges, a dark spot in the middle, and a vague dark diagonal band, on each forewing. The hindwings are pale yellow. The wingspan is about 2 cms. CSIRO Publishing, Melbourne 1994, pp. 95, 97. Volume 17 (1893), p. 176. Volume 41 (1916), p. 370.